Healing rites were being performed and herbal remedies sold by an array of practitioners on the exhibition floor of the Metro Toronto Convention Centre. In Jamaican parlance, the hall had been transformed into a massive balm yard. There were pranic healers using their touchless hand motions to remove illnesses and consign them to literal dustbins; and a contingent from the Rocky Mountain Mystery School similarly used mystical hand waves to cast out worries. 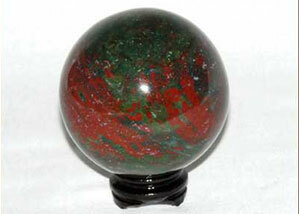 A bloodstone crystal ball from Friendly Crystals. Bloodstone has been used to protect from the evil eye but is also a symbol of righteousness. All over the hall, were people offering brand name snacks, foods and drinks made with herbal concoctions to cure illnesses and maintain good health. 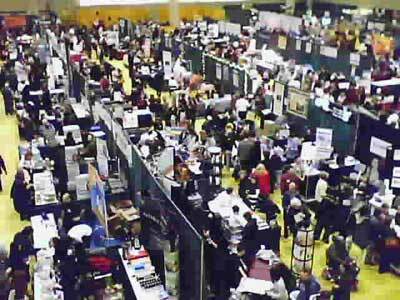 There were representatives from the fields of naturopathic medicine, accupuncture, yoga, chiropractic and reiki. But clearly and conspicuously absent were any Caribbean obeah or voodoo practitioners. Here were men and women, shamans from North America, Asia, Europe showcasing their bush medicines and metaphysics and absent were some of this hemisphere’s most powerful mystical artists. It could be because Britain’s former Caribbean colonies and Haiti have not recognised or legalized the practices that were banned by the colonizers who feared the liberating potential of the unseen powers in the hands of the enslaved. One proof of the power of obeah may be that it is still alive despite official resistance since the 1600s. That alone qualifies the Caribbean practice and its healing balm yards to share billing with the pranic folks who, while claiming it to be an ancient art, acknowledge a 1987 founding in the Philippines by chemical engineer Choa Kok Sui (1952-2007). “Pranic healing uses the energy of prana – life force – to accelerate the natural healing power of the physical body,” says the group’s Canadian Web site. A CBS report says it has been embraced by a few physicians in California. “Pranic Healing is not intended to replace orthodox medicine, but rather to complement it. If symptoms persist or the ailment is severe, please consult immediately a Medical Doctor and a Certified Pranic Healer,” was a disclaimer by founder Choa Kok Sui. Scores of people converged for the health show. “Many Africans believed that the Obeah man had within his power the ability to render someone invincible, resuscitate the dead, cure all diseases, protect a man from the consequences of his crimes, and cause great harm to anyone he wished,” wrote Alexander Giraldo of the University of Miami. “Yet the Obeah man’s most powerful gift was not his ability to steal people’s shadows, as the act of obeah or ‘hexing’ was described, but his intricate knowledge of herbs and poisons,” Giraldo writes in the piece Obeah – The Ultimate Resistance. To get a hold of the obeah man’s services, you must visit his balm yard. Whether it’s love problems or arthritis, money matters or infertility, there is an answer at the balm yard. A 1950s mento (Jamaican pop before ska, rock steady and reggae) tune, Healing in the Balm Yard*, written by E. F. Williams and performed by Harold Richardson and the Ticklers said it all: whatever you wanted was achievable in the balm yard. “These ‘Balm yards’ are deep in the lives of the Jamaican peasants,” wrote Zora Neale Hurston in “Tell My Horse: Voodoo and Life in Haiti and Jamaica” (1990), based on travel to the countries in the 1930s and participation in rituals as an initiate. “Jamaica has its ‘bush’, that is, the island has more usable plants for medicinal and edible purposes than any other spot on earth,” Hurston wrote. “A Balm Yard is a place where they give baths, and the people who operate these yards are to their followers both doctor and priest. Sometimes he or she diagnoses a case as a natural ailment, and a bath or series of baths in infusions of secret plants is prescribed. More often the diagnosis is that the patient has been ‘hurt’ by a duppy (ghost), and the bath is given to drive the spirit off. Only Guyana under its late president, Forbes Burnham in the 1970s legalized obeah. Back in 1990, the Inter Press Service (IPS) news agency reported that a group of Jamaican Rastafari were lobbying for its legalization on the island. “We’re calling now for (the anti-obeah laws) to be totally abolished,” IPS quoted attorney-at-law Miguel Lorne as saying. “They (the practice) have worked for me. I would go to an obeah man any day. Nobody can work magic like an obeah man,” a businesswoman, Jasmine Edwards, told IPs then. With such an endorsement from a satisfied client, and the Jamaican economy in shambles, one may be tempted to propose that the retardation of the country is proportionate to the resistance to obeah and other indigenous cultural expressions. Consider the medicinal and spiritual value of Jamaican marijuana for example and the combined potency with obeah as the country markets itself as the healing centre of the world. Some might say Edward Seaga, known to have had a long association with practitioners of the more acceptable Kumina and its blood rituals, did not bring much success during his 1980s prime ministership. But he never went the whole hog and freed up obeah. It’s full time this be done, because it’s what Jamaica and the world now need. Obeah men would participate in international health shows, visitors would flock to Jamaica and the world would get its economic cure: a healing in the balm yard.